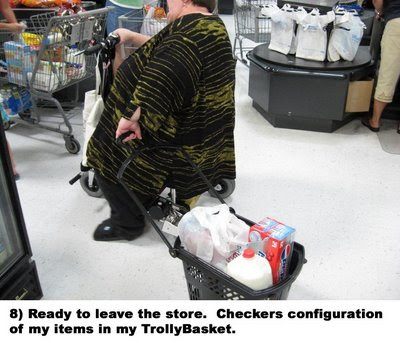 It was easier for me to get heavy items in the TrolleyBasket than to try to get them onto the bottom of my TravelScoot. The TrolleyBasket is made from plastic that is similiar in thickness to my laundry baskets. 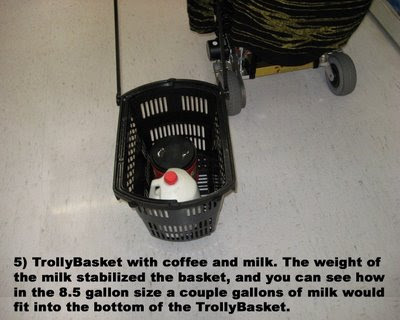 The top rim of the TrolleyBasket is a lot heavier than the rest of the basket. The handles appear to be sturdy and strong. I lifted everything I bought on this trip into the house using the carrying handle of the TrolleyBasket and it felt solid. 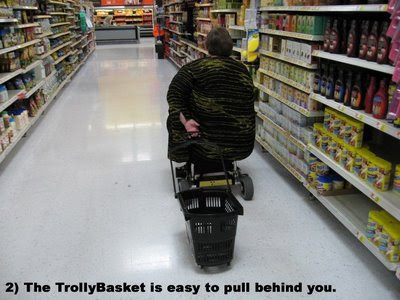 The TrolleyBasket pulls very easy and is free wheeling. Peter put all 4 swiveling wheels on mine. I like that. The TrolleyBasket has 2 handles and you can use either one to pull it from the TravelScoot. I found the longer handle easier to use. The handle on the TrolleyBasket will not go down low enough to attach under the seat of the TravelScoot, but if you let go of the handle it stays in a little higher than horizontal position so its easy to grab and you can let go of it while reaching for items without problem. Living alone the 8.5 gallon size is okay for me and the dog. 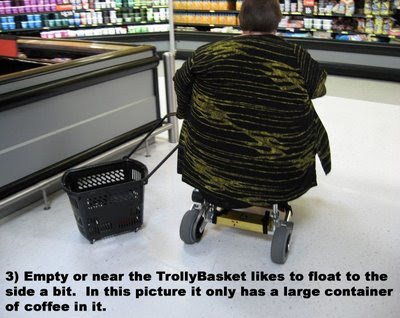 If you have to buy a lot of heavy items you might want to purchase a larger size TrolleyBasket. 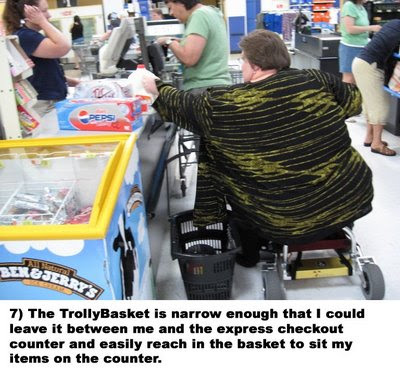 I didn't really have any issues with the TrolleyBasket. 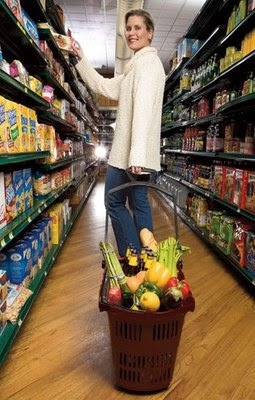 I do wish I was able to pull it behind my TravelScoot if I needed too, but it is much easier to handle than a full size shopping cart in a crowded store. I am pleased with mine, I will use it on shopping days when I need laundry soap, milk, pop and other heavy items that all won't fit under my scoot in the caddy. I'll keep you updated on how it wears with use. 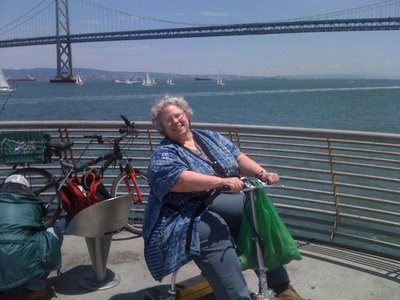 Doesn't Lynn Ellen makes a wonderful San Francisco Scooter Babe? This picture is from her weekend adventure. I love the hat! You asked me about the how long the belt lasts and other TravelScoot use and wear data. I have been practising changing the Travelscoot Synchronous 5M 660 belt. It took me twenty minutes, and it is the third time I have done it myself. The other 3 times, I got a friend to do it and watched him. I want to be expert at replacing, so that whenever the belt breaks I can fix it -by the side of the road, if necessary. One belt lasted me eleven months one other lasted only thirty days. Once when I was overseas and ran out of belts Hardy kindly sent one by immediate courier and so I was able to get moving again -to be with no belt is a disaster. Here is a you-tube video of my fixing the scooter and then one with my friend trying to fix it. May I say something about the lovely and informative community of ideas that has developed on your Elizabeth TravelScoot website? It is that I notice reference to a picture of a bell with a crossbones image on it and a few places where mention of "high speed" and even a "not stopping for anyone" and "wind in my hair"! these terms are a bit radical ! (?) 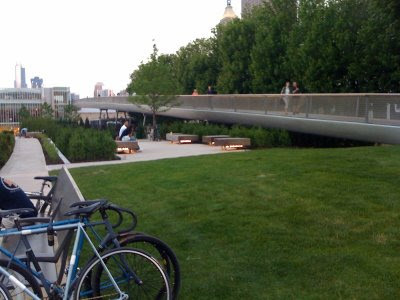 If there was ever an accident -God forbid, with a TravelScoot, the data in this website could be construed to show a cavalier attitude to fellow citizen's right to walk peaceably. I regularly search "electric wheelchair" in Google News and see many instances of people upset by scooter-users hogging the sidewalk - some injured; some others seeking revenge! God forbid, already! I hope you won't think the preceding three paragraphs as being unwelcome or inappropriate and I hope you won't bar me from participating in the fabulous Elizabeth TravelScoot web page. Daniel, we welcome your participation on this blog. The references we make to speed is really more about having a taste of independence than about wanting to cause danger for anyone. I'm very careful around pedestrians, and I'm sure everyone else is too, because we don't want to give TravelScooters a bad reputation. I had to get lab work done today. 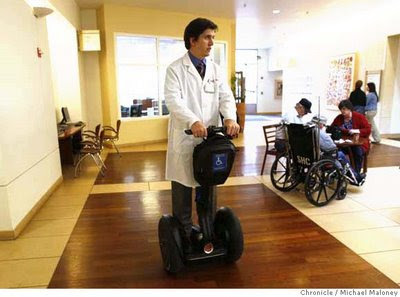 When I was leaving the lab, here comes a little old man on a TravelScoot, with his nurse/home health worker trying to keep up. I told him I had one like his and he suggested that we drag race, how I wish I had my battery. He told me that he has a big scooter for when he takes long trips and will be sitting for long periods. He said he loves his TravelScoot for when he wants to scoot around town and has alot of stops to make. His companion said she likes the TravelScoot better because it is easier to get in and out of the car. I told Rhonda I couldn't believe someone in Baton Rouge had one and we didn't know him! I decided to drive into San Francisco rather than take public transportation, which was a mixed blessing. it may have been more direct than transfering from BART to the city train, but the time it took to find a place to park probably evened it out. I did find a good spot, assembled my TravelScoot, and since I've purchased the Travel bags that Hardy sells, I put some supplies in the bag and slipped it over the stem of the seat. I also decided to attach the triangle soft basket, and the travel bag sort of set inside of it, and only once did I try to get off the Scoot by stepping into the center of the triangle, the strategy I used when I was first getting used to getting on and off. I am still hanging a shopping bag sized nylon bag from the handlebars for my immediate needs, which seems to work well. As you know, San Francisco has a lot of hills. I parked in the middle of the street, and I was headed south, which meant going downhill. I didn't want to rely on the brakes, and if I let myself free-wheel down the hill, it was hard to stop even with brakes and my feet. so I sort of walked myself down the hill. Also there were lots of people walking in all directions. Finding curb cuts at each intersection was challenging, as well as avoiding getting my wheels caught in street car tracks, but the cars were having to go slow with all the foot traffic, so that was a plus. Sometimes people would not see me, or they'd step in my way suddenly. Sometimes I called out "excuse me" or just waited, but the sidewalk was narrow, and while there was grass to stand or walk on, not for me. I think this is still just a part of learning to navigate. The other challenge is when the sidewalk is not level, perhaps in both directions, or I have to navigate the sidewalk sloping down away from the houses and toward the streets, and then there are driveways that make the sidewalk go up and down. I find that I'm leaning toward the high side, or I just have to slow down. Being able to walk the Scoot at times is essential. I got to Dolores Park, and I drove closer to the stage, but the most direct path involved two sets of about 5-6 stairs. 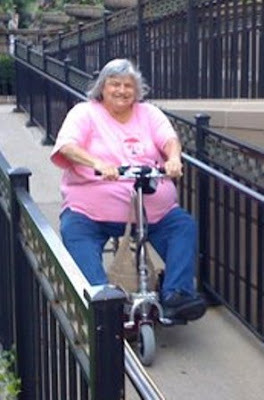 I got off, and started to lift the Scoot sideways up the stairs. 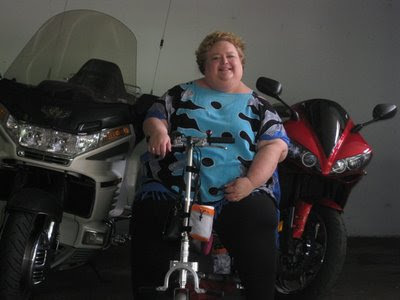 I held the handlebars in one hand, the back of the seat in the other, and lifted the front, then the back, step by step. with both lithium batteries, plus a bit of gear, the Scoot now weighs 40+ pounds, which is a bit heftier than what the frame weighs when I take it out of the car. I got some help from someone, but when she grabbed the seat back, the pad slipped off the stem. We just put it back on the stem, but this was an unexpected thing, and I hope it isn't going to come loose and fall off on its own. I was able to half ride, half walk the Scoot over to the grass in front of the stage, but at one point there was a dip between sidewalk and grass, and I almost tipped over. I think getting off to navigate uneven surfaces is best. But I had my own ringside seat, and I find the emergency brakes very helpful, as even then the ground was sloped. 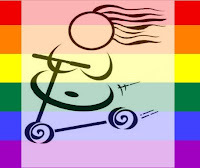 I walked the Scoot back down the hill and the stairs were too crowded, and I got myself at the front of the Dyke March with the other Scooters. I had the only TravelScoot in the march, and it did just fine on the streets of the city, pacing the march just fine. I did have a new mishap, however. I was pacing a group of women who were doing percussion together (the group is called "Sista Boom" and they are fabulous) and sharing my water with a friend who was percussing. The hill I was on was very gentle, but I think it was the fact that I wasn't changing my speed, so even though I was going slow, it was a constant load on the motor. All of a sudden it just stopped, but the green indicator lite stayed green. I walked it over to the curb, got off to swap the batteries, thinking that still might be the problem, and at that point I felt the motor and it was really hot. The other battery also turned the light green, but no go. So, I sat still, thinking that either I'd burned out the motor and it was dead, or, hopefully, it was just overheated, and once it cooled it would be fine. It was about 85 out, but I think this could have happened on a cooler day. I probably waited no more than 10-15 minutes and tried it again, and voila! it went fine. and that was the last time that happened, but in fact I was almost at the end of the march and was ready to go find my car. Finding the car was a challenge, as I was off by a block in each direction, but fortunately I never had to try to go back uphill in the way that I looked for it. it was also dark when I was on my way back to the car, and I was aware that my visibility on the sidewalk, still filled with people meandering and partying, was difficult to navigate. I think I might get a bike light for future trips at night, especially when I'm alone. but never did I feel at risk for personal safety. I was just hoping that I wouldn't have to spend the rest of the night looking for my car! And I did find it, and packed up and head out for home. I think I'm ready for Australia!! Tom and I went to an air show this weekend in Baraboo/Wisconsin Dells WI. Of course we took my TravelScoot. Scoot propelled me through 4 inch high thick grass on a hard base. He was slow starting. Grumpy little guy. Once he got going, we zipped. We enjoyed the show until the last half hour when we got rain. Scoot got showered upon, but not bad. No problem. Sorry no pictures. The rain ruined that. Our next event was to give our annual donation to the Indian Chief. We went to Ho Chunk Casino and deposited our $20 "dues" into the slot machines. Sorry no pictures here either. They don't allow them in the casino. 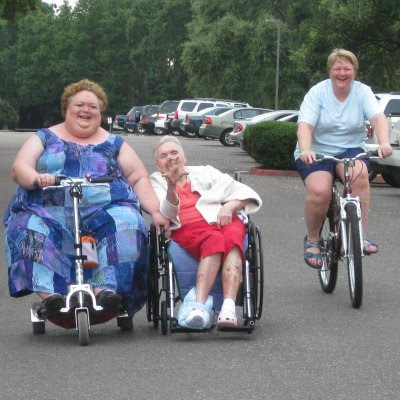 WOW - Women on Wheels! Saturday was a red-letter day, but I seem to be having a lot of those since I got my TravelScoot. Rhonda spent the day with me and Rae (my younger sister) and took some spectacular pictures of us taking our mom for a scooter/wheelchair/bike ride on the grounds. In the picture you'll see my left hand on her right arm rest. We were in motion, going full speed, wind in our hair, when the photo was taken. The funny thing is that a doctor came out while we were doing this and he looked VERY interested in our modes of transportation. He eventually got in his car to leave, but drove away and then turned his car around so he could take a second pass by us. These nice folks are Sarge and Bee. 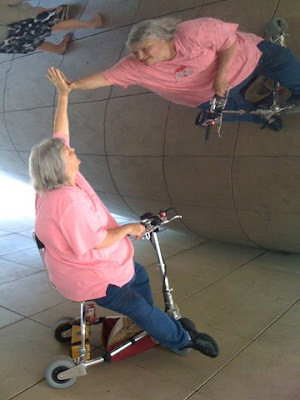 They've had their TravelScoots for a year, and they use them for cruises, shopping, socializing, and anytime they need a little help getting from point A to point B.
Ok, Here goes... Angeli and I made our trip into the Chicago Loop on Tuesday. We had a short distance over rough sidewalks to get to the EL. We were lucky that this El stop was equipped with an elevator for us to ascend to the boarding dock. The attendant made it as comfortable as possible for us to board. She even let me ride for free and arranged for a board for me to scoot onto the train. This train was not too busy so all went well. Because there was no elevator where we wanted to exit, we traveled to the next exit. There we were...in the Loop, people everywhere, busy sidewalks. I had to be real precise with my acceleration and deceleration to make sure I didn't run into anyone. We went first to the Millennium Park. There was a really neat interactive fountain where the water ran over two tall structures and came cascading over the heads of all those who took part. 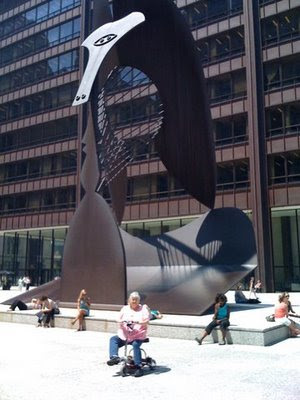 Next Angeli showed me the amphitheater where she will graduate next May from the Art Institute on Chicago. Then we went to the "Bean". It was fun to watch our reflections from different angles. The real purpose of the trip was to go to the Art Museum. We ascended a really long, sloped bridge. I was fully prepared to turn around and find another entrance, but guess what? Me and Scoot made it all the way. They let me and my TravelScoot in. There I was scooting along among Renoir, Manet, and even Monet. It was wonderful. I had two "incidents" where I cut the corner too close and hit the corners of display cases. Angeli shrunk into the ground. I gave a sheepish grin. Nothing was damaged except my ego. Time was catching up on us, so out tour was brief. We made our way back to the El stopping at Starbucks for a drink and to cool off. It was time for people to be leaving work and there was lots of traffic.. Angeli decided that since it was so busy that she would lift scoot into the train. She pushed her way into the train and gave me a good position to scoot off when we arrived at our El stop. This is where the real problems surfaced. The elevator on this side of the tracks was out of order. here was a long two story set of steps to get to the lower level. At the bottom of the steps was a huge alligator turnstyle. No Scoot here. Our only option. We took off the batteries for me to carry down the steps. Angeli carried Scoot up two flights and over the tracks just to find another broken elevator. Finally she found one that worked. At the end of this journey my daughter was exhausted and I was in tears because my legs and back hurt. I don't think I will attempt the El again. Despite the final problems, it was still difficult because of the people. I WILL go to the Loop again. It was great to be able to see what before I had only heard about. Scoot and I conquered my walking problems and allowed me to be free. Dr. Peter Poullos was a first-year gastroenterology fellow, paralyzed from the shoulders down in a freak accident. 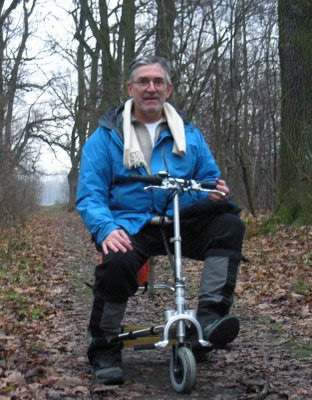 Nine months into his recovery he reluctantly ordered a motorized wheelchair. One night he and his wife happened upon a show on the Travel Channel called "Accessible Adventures." What happened next involved a visit to a Segway showroom that changed his life. 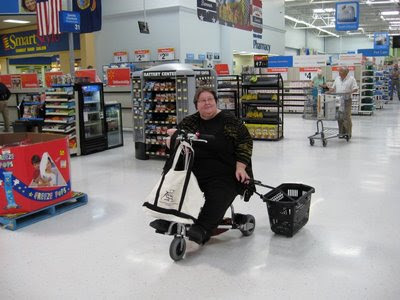 I've posted the link here because Dr. Poullos writes about how insensitive some people can be to those using mobility aids. It's an interesting article about using a Segway as an alternative to a traditional mobility aid. Many comments have been made about my "Elephant in the Room" post from yesterday. I've compiled them into a separate post so our email subscribers don't miss out on the comments. I got such positive support from my spine doctor for using the Scoot, and she is always encouraging me to move move move as much as I can. But she could see how it will help me get out, do more, and how this particular scooter requires dexterity, strength, balance and fortitude. But I like what you say about folks thinking they know what it is like to live in our bodies. Bah! Now let's get that elephant onto a scooter already!!! Another thought: My health status is not immediately apparent by looking at me. There are a lot of assumptions made about people of my size (super) in terms of my strength, balance, flexibility, fitness, cardiovascular health, eating habits, self-esteem, emotional health, sexuality - just to name a few. i guess i am lucky in that no one has said this to me, yet anyway. i do know that there is NO WAY i could cruise without it and i love my cruise ships! My family and friends have been nothing but supportive about my scooter because they know how much MORE it helps me get done. Using a scooter isn't out of "laziness" it's to help us do all we can do and all we WANT to do. I have gotten more exercise using the scooter than I was getting before. I was even sore after the first few times I used it. It makes me use muscles I apparently wasn't using as much before. Screw people who think we don't deserve to get as much out of life as we possibly can. "If you get a scooter, you'll stop walking and it's just a downward spiral from there." This has been my fear and one reason that I've been putting off getting the Scoot. It's good to see that it hasn't been the case for many of you. 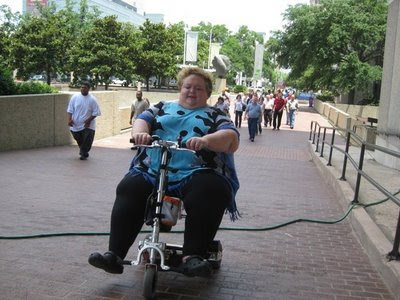 Darlene is a large woman and she uses a power chair. I stayed at home for years because I couldn't handle the pain in my back and knees. 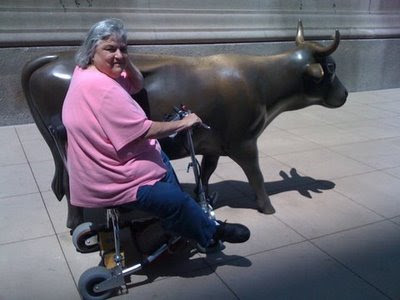 Once I became mobile with my power chair, my quality of life improved drastically. Now I can go just about anywhere since my power chair fits through most doors. So what if you become dependent on the scooter or chair......better than living a boring existence! 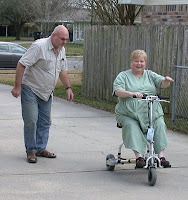 Why is it that there are so many well-meaning loved ones with unreasonable fears of the use of mobility aids? Why do they think they understand what it's like to be in our bodies better than we do? No one should be in constant pain when they're walking. The common experience here is that once we started using our TravelScoots, we realized how we had limited our lives, usually without even realizing it was happening. It's not that we weren't doing anything, because as a whole this is an active and accomplished group of people. This is the 21st century and using the technology that's available to us expands our lives. We're able to do more for ourselves and our families, whether it's working, grocery shopping, going to the zoo with our grandkids, riding through a forest, feeling the breeze in our hair, getting to the airplane, going bike riding with our child, getting across campus, touring the Smithsonian, taking a cruise, going to the camp, shopping the mall, riding to the clubhouse for lunch with the girls, vacationing at Disney, traveling to Australia (or just down the street! 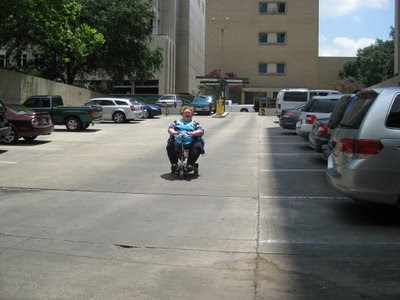 ), or taking a long "walk" with mom while pulling her wheelchair. We are not people on a downward spiral. We are people looking for ways to live our lives more fully. Who gets to decide that the only acceptable way to get from point A to point B is to walk? If grabbing every ounce of gusto out of life that we can means using a TravelScoot to do it, then so be it. If you'd like to share how your experiences with people objecting to you using a scooter (cane/wheelchair/walker/crutches, etc. ), post in the comment section or send me an email (elizabeth@ifisher.com). 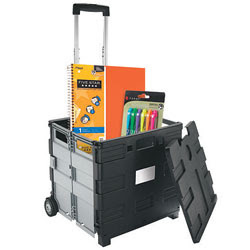 UPDATE: Rolling Collapsible File Cart -- Just say NO. Hi everyone. If you read the "Rolling Collapsible File Cart" post I hope you read Cynth's comments and did not run out and buy one. Rhonda says hers may have one more use in it, but that's it. I recently purchased a second battery for my TravelScoot. My first battery is the light-weight lithium ion battery. For my second battery I got an SLA battery. The advantage of the SLA battery is that it's less expensive than the lithium ion battery, and it doesn't need to be protected from heat like the lithium ion battery. It also won't overload and shut off in a high stress situation. 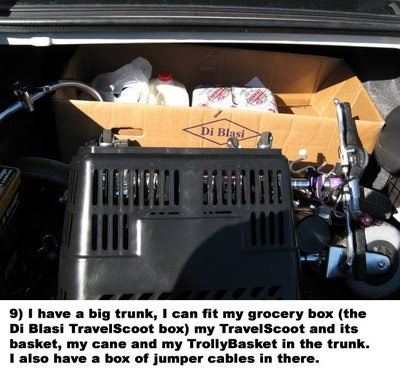 The best advantage, and the reason I got it, is because I can leave it in the trunk of my car with my TravelScoot and use the scoot at any time. Before I had to remember to have my lithium ion battery with me, and also carry it with me so it stays cool. The disadvantage of the SLA battery is that it is HEAVY! With the SLA battery my scoot weighs 49 lbs. With the lithium ion battery it weighs 35 lbs. I solve that problem by lifting the battery in and out of my car separately from the scoot. I tried the SLA battery for this first time this morning in Walmart. It worked great. I zipped around the store like I always do, and I didn't notice any difference in the way the scoot handled at all. I'm happy having both types of batteries, but eventually I'll add a second lithium ion battery, so I can travel with two lightweight batteries. I'll still keep an SLA battery for my car. In the picture the larger battery (in green) is the SLA battery, and the smaller battery (in gold) is the lithium ion battery. It's great that you can stack them too, and it's easy to do. For more information on the difference between the batteries, go to http://www.travelscoot.com/batteries.htm. I ordered one from Amazon.com at the link Peter sent me. I also responded to him in email telling him I had ordered one there and it would be nice if we could select our choice of color from amazon as that is not a selection item there. That is great - I hope you will enjoy it. I can send you any color you want if you just let me know. 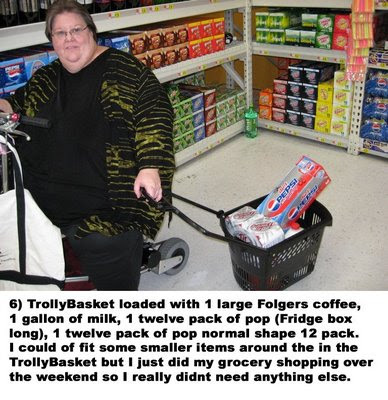 Enjoy the rest of your weekend and good luck with the TrolleyBasket! So I asked him to send me a black one. So if you order one you might email Peter first and ask him if he would also send you the color you desire. 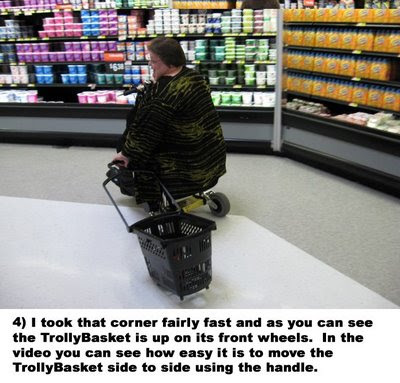 Paper, Plastic or a TrolleyBasket? This looks like it would be good to pull behind or left hand drag for shopping on the "out of everything days". It has nice rubber wheels, the front ones swivel for easy pulling. Of course we would be happy to sell you a TrolleyBasket. I would be very interested to learn about your experiences with it together with the mobility scooter - I think you will find it to work well. I would recommend the 8.5 gal version which we have in red, blue or black and that is $24.49. I would be happy to send you a basket if I may ask for your shipping address and payment information (credit card or check). If you prefer you can also purchase it directly from Amazon.com using this link. I spent today shopping in the *$!% heat with Hope, Melissa, and Melicia. We did lunch, went to the tailor, then spent hours in Catherines, Simply Fashion, and Lane Bryant. While I didn't get as much exercise walking as they did, I got a lot more than I would have staying at home, which is what I would have done without my scoot. I lifted it in and out of the van, was up and down off it a lot, and walked in the smaller places, like the restaurant and the tailor. Even as close together as the clothing racks are at Catherine's in Hammond Aire , my scoot and I fit fine. Before I had my scoot I wouldn't have tried a day like today, and I probably would have told myself that shopping wasn't something I really enjoyed anyway. I would have been lying to myself, because today made me very happy. I hope you can see this picture well enough to see the absolute joy on my face. I was going down a really great ramp that is the closest I've ever come in my adult life to a roller coaster ride. I think I was screaming at the time too! Rhonda took this photo in the parking garage during our Wednesday adventure. Isn't it amazing how small the Travelscoot is compared to these motorcycles? The first email subscription link I added didn't seem to work properly so I deleted it and redid it. Please subscribe again. After subscribing you should get a confirmation email asking you to confirm the subscription. Hopefully this one will work. Thanks for your patience. 3:15 p.m. update: I just got my first subscription email to this blog. It only goes out once a day, between 1 and 3 p.m. central time. When Rhonda and I were having our grand adventure on Wednesday, one of the things we did was test the ramps around the Governmental Building in Baton Rouge. I hope you can get an idea of the length and slope of this ramp from the picture. Our TravelScoots handled rolling over the hose with no problem. 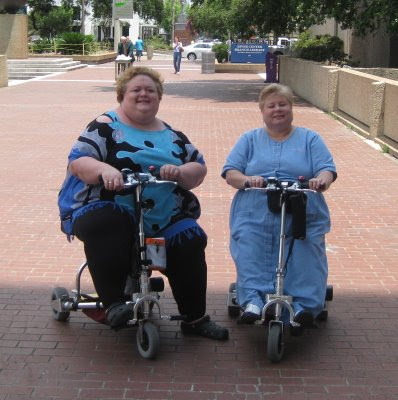 Rhonda and I have identical setups as far as scooter size, motor power and battery, but I'm a lot larger than she is. She was able to get up this ramp just fine, but I fell short of making it. See all those people in the background? Well, I had to use the brakes and sit on the incline until the group passed, then I turned around and rolled back down the hill. That restarted the battery. The next time I came up the ramp I knew where it was going to overload so I stopped before that, locked the brakes and got off, then unlocked the brakes and pushed my scoot a few steps to the top of the incline. For some ramps, when I know I'm going to have trouble, I put my feet down and help the scooter along. So, what is battery overload and why did it happen? Hardy Huber has a great explanation of the differences in batteries on his website, at http://www.travelscoot.com/batteries.htm. I highly recommend reading it, if you haven't already. 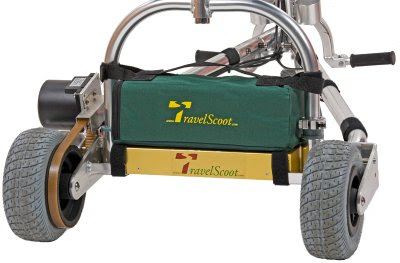 There are two batteries available for the TravelScoot -- the lithium ion and the SLA (sealed lead acid). The lithium ion is a higher capacity battery and at 6 lbs., is much lighter in weight than the 20 lb. SLA battery. However, as part of the advanced technology of the lithium ion battery, if the battery is pushed too hard it will automatically shut off to keep from damaging the battery. To restart it you either have to plug it into a charger briefly, or keeping the power switch in the on position, you can give the scooter a hard push. I find that the "hard push" works best if it involves a strong 10-year-old boy (waves to Mark!) running while he's pushing the scooter from behind. However, I don't always have a 10-year-old boy handy, so another option is to turn around and whiz down the same incline I just came up. It almost always restarts the battery. If you're a smaller person (250 or less), you shouldn't have any problems with a ramp like this one. If you have questions, write a comment and I'll do my best to answer. UPDATE 6/22/09: Rhonda has decided this was a BAD IDEA. She said she might get one more use out of hers and that's it. I just got back from a scooter adventure at Target. Actually, first I parked at Office Depot and went in and purchased a rolling collapsible file cart to pull behind my scoot when my work doesn't fit in my other briefcases. But I also had to go to PetSmart and Sally's, so I opened up the rolling cart and pulled it behind me to the other stores. When everything was packed up I headed out the door and all the way over to my car, two parking lots over. Some young kid went driving by in a huge truck, blew the horn and rolled down his window to tell me how "cool" he thought my scooter was. Hi everyone, I just added a way to subscribe to this blog via email. I'm not sure if it works properly, so I subscribed to test it, now I'm posting a test post to see if it works. I'll let you know. As of 9 p.m. I still haven't gotten anything by email, so I still don't have confirmation that it's working. As of 9 a.m. Friday I still haven't gotten anything by email. Cynth, have you gotten anything? Rhonda and I had a grand adventure today. I was off so I met her at her house and went to work with her to see how she uses her TravelScoot there. We loaded both our scoots in her Honda CRV and drove to a downtown parking garage. From there we scooted to the Governmental Building. We went up and down several ramps (I'll explain more about how that worked in future posts), rode on the elevators several times, and made lots of new friends. I wish I'd thought to get a picture of the waiter trying out her scoot. To say he was enjoying himself would be an understatement. After work we went on a quest for TravelScoot-compatible accessories. The Honda motorcycle store had nothing interesting, but Walmart had a basket with handles that Rhonda bought and will fill us in on how it works out. When I was loading my scoot back into her vehicle I did something weird and got the battery stuck. I don't think I could reproduce what I did, but we both think it happened for a reason because a nice man who was walking by asked if he could help. It turns out that his wife has MS, and isn't at the point where she needs a scooter yet, but he said he likes to be on the lookout for things that could help her when the time comes. Back at Rhonda's house I helped get her set up to post comments to the blog and to get the pictures off her digital camera. I suspect you guys are going to be hearing a lot more from her. The picture with this post was taken by a man who was using HIS camera to take a picture of us. Go figure. Lynn Ellen asked for more details about the logo. The one with curly short hair is the original one that Cynth drew. The one with spirals on the wheels is my version. I don't have a high resolution version of Cynth's, but I do have a high resolution version of mine. You are free to use the logo, but only for goodness, or the scooter goddesses will be angry. If you need a higher resolution, email me -- elizabeth@ifisher.com. 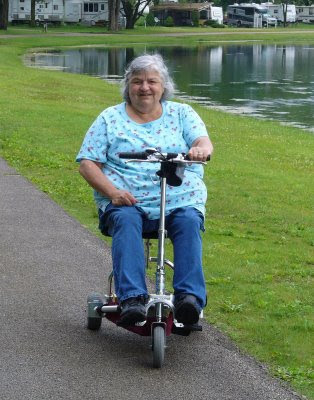 I had some fear about going traveling on public transportation on the Scoot, as well as going out for several hours with the Scoot as my only support - no car or even a cane. I didn't intend for this trip to be via Scoot, but when I learned that my destination was close to the ballpark where the San Francisco Giants play, and that game time was the same time as party time, well, here was my opportunity. I parked at the BART station, assembled the Scoot and mounted both of my batteries. That Hardy, he thinks of everything. The strap that holds the battery didn't look adequate, but then I saw that he'd installed velcro in such a way that the two batteries sandwich together with the velcro and the straps are ample to fit around both of them. I have no idea how this works with the less expensive, bulkier battery, but my two golden beauties just nestled perfectly. I plugged one in, and tucked the end of the cord of the spare in such a way that it didn't move or risk being snagged. I purchased a ticket and found that BART has installed a wide gate, so I could scoot right through. The train was coming, and I couldn't see where the elevator was. so I got off the scoot, held it firmly next to me, hitched the front wheel onto an escalator stair, and up we went. Now I'm strong, so virtually carrying the now 40 lb. Scoot wasn't much of a challenge. At the top of the escalator, I just walked through the closest door of the BART car and since there is a designated space for disabled people, I saw two guys get up (gee, thanks!) and I sat down and tugged the scoot close to me so it was not too much of a traffic obstruction. The BART car wasn't crowded, but if it had been, I figure we would have just worked it out. I rode to the Embarcadero station in San Francisco, walked off and hoisted my Scoot onto each of the two escalators I needed to use to get to the street. Good thing, as the elevator to the street for that station was out of service. I'd left the house early (a pause, as those who know me aren't used to me being on time, let alone early), and I made my way through the street vendors at the foot of Market Street, and then I went into the Ferry Building. I took advantage of the bathroom there. Again I was surprised when someone motioned me to the head of the line to use the big stall. When I'm on foot, I will wait til the big stall becomes available so I have enough room, but I wasn't expecting to get to go ahead of others. Then I rolled around the Ferry Building, enjoying the sights and smells. After that, I went back outside and made my way along the water, enjoying the sun, the wind in my face when I could go faster. Only once did I get yelled at when I was aimlessly weaving a bit, and it was a man on a bicycle yelling that I was in his way. Funny, I didn't think bicycles were allowed to ride on the sidewalk. Oh well. Along the way, I found Pier 14, just a stretch of walkway that jutted out into the water about a block long, ending in a circle where several people were fishing. I was still on the north side of the Bay Bridge, and I asked a tourist to take a picture of me with Oakland and the bridge in the backdrop. I then proceeded to my destination, and as I arrived early, I found a patch of shade nearby to park (the parking brakes were helpful) and talk on the phone. At the party, I mostly sat with friends on chairs, but at one point I did use the Scoot to move between the two rooms. it was a good group, and there was good food. I even used the seat of the Scoot as my table at one point, as there were more chairs than tables. When I left, I made my way back on the other side of the same road. The entire journey from BART to party was about a mile each way. I rode an escalator down, also holding the Scoot, but couldn't find a working down escalator when I got inside the paid BART area, so the attendant pointed me toward the inside elevator. That was fine, and my ride back was uneventful. I found the elevator before the escalator, but overall I was glad to have both options. When I got back to my car, I was disappointed to have to get off. And while I felt refreshed and invigorated by having had my adventure, I wasn't exhausted by it. nor am I apprehensive about taking public transportation, or being out on my Scoot out in the world, with no car nearby. who needs it!!??! I received an email from Daniel, who has had his TravelScoot for 2 years. I don't think any of us have been in a forest yet, so he's really had an adventure! Convention on July 31st. Just wondering. Thank you! I'm glad you're enjoying the blog. The workshop I'm giving at the NAAFA Convention in Washington, D.C., on July 31st is going to be about living life as a very large person, and ways to adapt everyday activities to work for us. Two of the things we'll be talking about will be how to modify exercises to work for us, and how using a scooter as a mobility aid can help you live life more fully. Many people are hesitant to use mobility aids because they fear they will lose the ability to walk, or because someone they love is opposed to it. My scooter is allowing me to be more active and to enjoy things I wouldn't have gotten the opportunity to do, like going to the museum or even doing my own grocery shopping. Would you mind sharing your story with us? What kinds of places have you been able to go? Have you had any problems with your TravelScoot, like broken belts? Have you had to replace your battery yet? You've been using yours longer than any of us have. ball. We might go to the Milwaukee Zoo next weekend. isn't supposed to be so much fun. I saw the most interesting sight today. When I was taking a picture of the old Louisiana State Capitol building, there was a man driving by on a scooter. I kept watching him as he went down the street until he got to a point where he was going to have to ride through some bushes hanging out into the street. Instead of just going around them (which would have put him in a lane of traffic), he stopped and trimmed the branches by hand. Today Alan and I went on an adventure that we wouldn't have had without my TravelScoot -- we went to the Louisiana Arts and Science Museum. It is housed in an old train station that's just beautifully redone. We were able to parallel park on the street in front of the museum, and there was a handicap ramp that my scoot handled beautifully. (If it hadn't been there we would have carried the scoot up a few steps.) I rolled on a brick sidewalk to the door with no problem. Once inside we were treated to a collection of sculptures by Croatian sculptor Ivan Mestrovic, an ancient Egypt gallery (complete with a c. 300 BC mummy), a few sculptures by Frank Hayden, an exhibit of historical celestial maps, and an incredible collection of a century of women's purses, including twenty five Judith Leiber designs. In the picture I'm in front of a case of the Leiber handbags. I used the Think King cup holder to carry my camera. Afterwards we had pizza at Fleur de Lis, a Baton Rouge landmark that has been around since the 1940s, and did some grocery shopping at a store I haven't been in in years.